To form the strategy for the forthcoming General election 2014 for Kangra parliamentary constituency, Himachal Pradesh Congress Kanga unit hold a meeting of all office bearers and party workers at Rajiv Bhawan, state party office, Shimla. 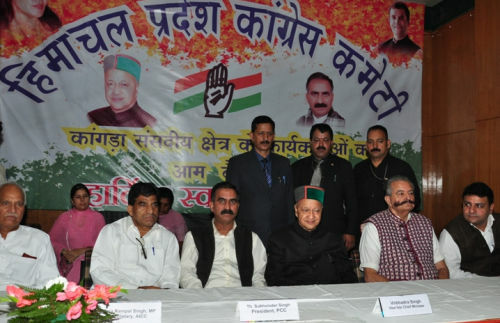 Most of prominent state leader including Chief Minister Virbhadra Singh, party state President Sukhvinder Singh Sukhu, All-India Congress Committee (AICC) Secretary and in-charge for Himachal, Ram Pal Singh, cabinet ministers, legislatures, Ex ministers, MLA from Kangra parliamentary, presidents of the Block Congress Committees of all 17 Assembly segments and other party leaders were present at the meeting. 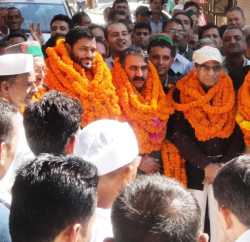 The meet was convened by state party Chief Sukhvinder Singh Sukhu to get feedback from workers so that the party could strategise the preparations for the Lok Sabha elections. 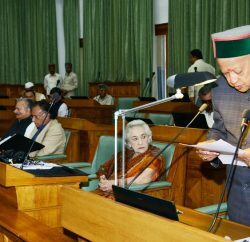 While addressing the party office bearers Chief Minister Virbhadra Singh stated that Congress party is marching in the right direction and have good chance to get all four parliamentary seats in the forthcoming general election. He asked party workers to work as a unit and take government policies among the electorates. He also emphasised the need for early declaration of candidates for the Lok Sabha elections. Singh stated that the candidates must be decided early and the selection should be fair and there should be no pick-and-choose policy as winning ability of a candidate should be the single criterion. He also targeted his predecessor Prem Kumar Dhumal and his parliamentarian son Anurag Thakur and accused them of using power for vested interests. However he heaped praises on veteran BJP leader and former chief minister Shanta Kumar. CM accused Dhumal for harming the interest of the state and promoting outsiders on the expense of common Himachali. He assured that those who were innocent would not be harassed and same those who were found guilty in the inquiries being conducted into the irregularities during the BJP regime would not be spared. All-India Congress Committee (AICC) Secretary and in-charge for Himachal, Ram Pal Singh emphasized on the need of strengthening of the grass-root level workers and advised party to take decision after due consultation with them. Addressing the gathering, Congress state president said that the motive of this meeting was to give platform to common party workers to address their concern and suggestions for the forthcoming general election. He revealed that party will prepare well for the election and to ensure win it will appoint 10 party workers in-charge of every booth so that the achievements and policies and programmes of the government could be publicised and taken to people. Power Minister Sujan Singh Pathania, Urban Development Minister Sudhir Sharma and former MP Chander Kumar also addressed the office bearers.